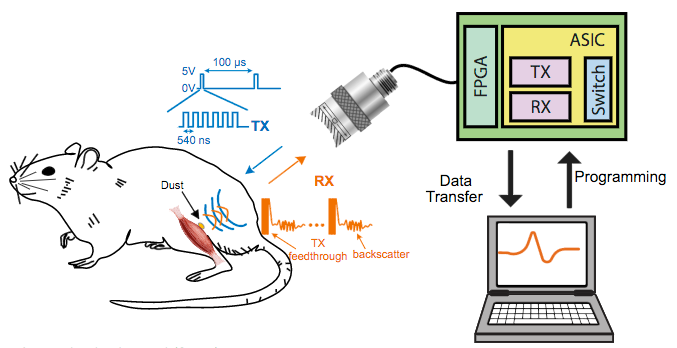 University of California, Berkeley engineers have designed and built millimeter-scale device wireless, batteryless “neural dust” sensors and implanted them in muscles and peripheral nerves of rats to make in vivo electrophysiological recordings. The new technology opens the door to “electroceuticals” — bioelectronic methods to monitor and record wireless electromyogram (EMG) signals from muscle membranes and electroneurogram (ENG) signals from local neuron electrical activity, and to stimulate the immune system, reduce inflammation, and treat disorders such as epilepsy. The technology could also improve neural control of prosthetics (allowing a paraplegic to control a computer or a robotic arm, for example) by stimulating nerves and muscles directly, instead of requiring implanted wires. The neural-dust sensors use ultrasound technology to both power the sensors and read out measurements. Ultrasound is already well-developed for hospital use and can penetrate nearly anywhere in the body, unlike radio waves. The researchers reported their findings August 3 in an open-access paper in the journal Neuron. 1. A team implants the neural dust mote. In the reported study, the mote was implanted in the rat sciatic nerve to do ENG recordings and in the gastrocnemius muscle to do EMG recordings. The tether-less connection also avoids potential infections and adverse biological responses due to micro-motion of the implant within the tissue. 2. 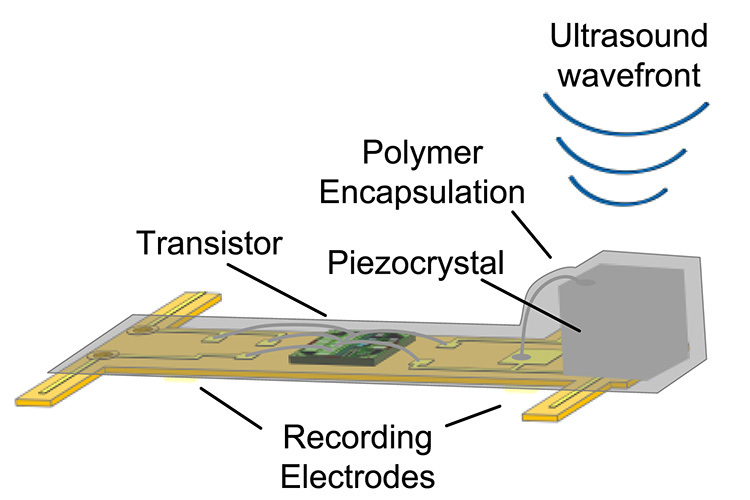 An external ultrasonic generator sends a ultrasound signal to a piezoelectric crystal, which converts the sound energy into an electrical voltage, used to power a transistor circuit — no battery required. 3. When neurons or muscle fibers fire, they generate a tiny voltage (action potential) that the two electrodes pick up and send to the transistor. 4. The transistor amplifies the signal and drives the piezoelectric crystal to vibrate at an ultrasonic rate. 5. That vibration interferes with the transmitted ultrasonic signal, causing a modified “backscatter” signal that communicates information about the voltage across the sensor’s two electrodes. 6. The backscatter ultrasound signal is decoded to extract EMG or ENG data. 7. A computer displays and records the information. The experiments so far have involved the peripheral nervous system and muscles, using an external ultrasonic patch over the implanted site to acquire information from the motes for the desired diagnosis or therapy. 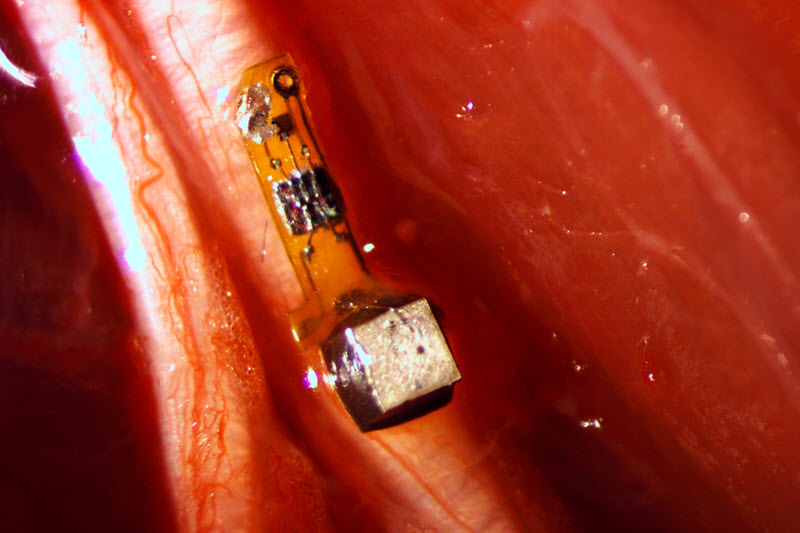 But according to the researchers, neural dust motes can be implanted anywhere in the body, including the central nervous system and brain to control prosthetics. This would be an alternative to today’s implantable electrodes (for Parkinson’s disease, for example), which require wires that pass through holes in the skull and degrade within one to two years. The researchers are now building motes from biocompatible thin films, which would potentially last in the body without degradation for a decade or more. Up to hundreds of wireless sensors could be sealed in, avoiding infection and unwanted movement of the electrodes, and could last a timeline, according to the researchers. The team is also now working to miniaturize the device further and they plan to use beam-steering technology to focus the ultrasonic signals on individual motes. The team is also building little backpacks for rats to hold the ultrasound transceiver that will record data from implanted motes. And the researchers are working to expand the motes’ ability to detect non-electrical signals, such as oxygen or hormone levels. The researchers estimate that they could eventually shrink the sensors down to a cube 50 micrometers on a side. At that size, the motes could monitor a few specific nerve axons and continually record their electrical activity. The researchers conceived of the idea of neural dust about five years ago, but initial attempts to power an implantable device and read out the data using radio waves were disappointing. Radio attenuates very quickly with distance in tissue, so communicating with devices deep in the body would be difficult without using potentially damaging high-intensity radiation. In 2013, the researchers published an open-access arXiv paper that described how a neural-dust system with ultrasonic signals might work. The ongoing research is supported by the U.S. Defense Advanced Research Projects Agency as part of DARPA’s Electrical Prescriptions (ElectRx) program, which is focused in part on developing interface technologies that are suitable for chronic use for biosensing and neuromodulation of specific peripheral nerves.